Waukegan (population: 87,901) is located in far northeastern Illinois in east-central Lake County. The Illinois Routes of 21, 41, 43, 131, 132, and 137 all lead you to and from Waukegan. Lake Michigan serves as the eastern border of Waukegan. The Chicago & Northwestern Railroad and the Elgin, Joliet, & Eastern Railroad both travel through the east side of town. Interstate Highway 94 runs by the west side of town. Waukegan sits just 8 miles south of the Wisconsin / Illinois border. 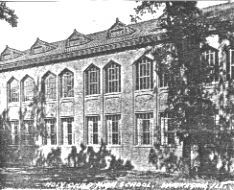 Holy Child High School opened its doors in 1910 as Little Academy of the Holy Child in Chicago (according to records of closed schools in the Archdiocese of Chicago), taking both boys and girls. For some unexplained reason, the school closed in 1912, only to reopen in 1914 as Convent of the Holy Child for girls only. During that same period, it was also referred to Academy of the Holy Child. 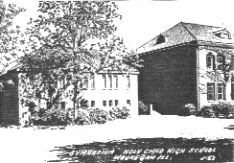 Then in 1921, the school moved to Waukegan & the name was shortened to Holy Child High School, while accepting female students only (28 all told). 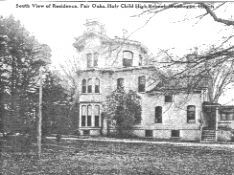 The Sisters from the Society of the Holy Child Jesus (SHCJ) were in control of the school, which was located in two homes along Lake Michigan on Sheridan Road. It also admitted boarding and day students. The first graduating class received their diplomas in 1924 when six students graduated from Holy Child. A new building was ready for use in 1926, but a fire destroyed one of the homes that served as living quarters in 1930. Another building took its place a year later (dedicated in 1932) that included a convent, dormitory, gym, and auditorium, while the remaining house was torn down due to being unsafe. Boarders were no longer accepted after 1956 in order to free up space for more classrooms, plus another building was erected the following year with classrooms, labs, cafeteria, and choral room added to the school. The move paid off for the school when it reached its enrollment pinnicle of 423 students in the fall of 1962. After that, the school's numbers steadily declined in part due to the opening of Carmel High School for Girls in nearby Mundelein in 1963. By the fall of 1967, Holy Child had 225 students, but gained slightly when the school celebrated its 50th anniversary in Waukegan in 1971 at 235. During the early 1970's, the national board of SHCJ decided to do a study of the schools that were operated by their community (including Holy Child), and because of a lack of teachers from within the community, competition with Mundelein Carmel for students, operating expenses, and low enrollment, it was announced that Holy Child would close in the spring of 1976 following graduation. Civic leaders and parents of students protested and appealed to the community to reconsider its decision, but even after attempting to find another order to take over the school, plus attempting to raise funds, SHCJ stood pat and closed the doors after 34 students received their diplomas on June 2, 1976. The school was sold to the Waukegan Public School District after it closed for use as an administrative center. There's a love that she has for her school. There's a school that shall ne'er be defiled. Like any high school, the girls at Holy Child must have had some of the experiences that any female teenager had, such as band, chorus, dances, proms, GAA, and other activities that would round out their high school years. From what can be told, the school is believed to have never been a member of the Illinois High School Association and never had a competitor in any athletic activity that was sponsored by the IHSA, since there is no record on their website that the school had any teams that were involved in IHSA postal tournaments or state final competition. We are aware thru the current parochial high school in Waukegan, St. Martin dePorres, that Holy Child alumni along with the Society of Holy Child Jesus have a presence in the newer school (which opened in 2004) and are supporting the efforts of the Cristo Rey model to revive Catholic education at the high school, while allowing students to receive hands-on training in the real world by going to work one day a week and attending class the other four. There is also a second verse, but we just learned the first! Thanks, it was nice to see information about HC, it was a great place to get an education and we were sad to see it go; we were one of the last graduating classes. I go to an all girl school so pity me,there are no boys in the vicinity and every night at eight they lock the door, I don't know why the hell I ever came before! I'm gonna take that train right into town, I'm gonna turn that damn town upside down, I'm gonna smoke, I'm gonna drink, I'm gonna neck and what the heck I go to an all girl school!" YOUR INFORMATION IS IMPORTANT TO US!! !